Again, we know that life underway is different than anything else that can be experienced, so I bring you the following. A few pictures depicting scenes from underway. 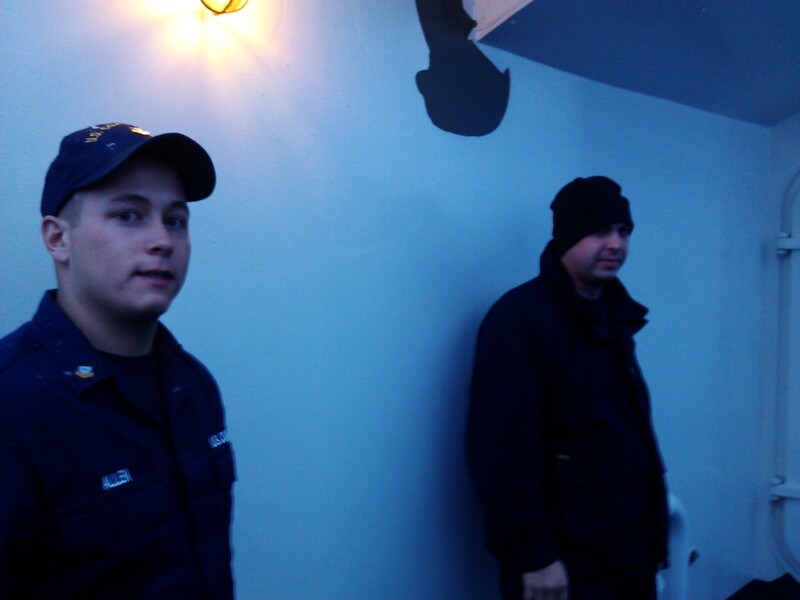 Here we have two of my shipmates standing outside the skin of the ship. We were departing from St. Ignace. If you were to judge by the light you would think it was twilight, when in reality it was only 10:00am. While outside, they were enjoying a quick smoke break. The opportunity to get a few minutes to ones self is valuable on a ship. The flag as it is draped from the flagstaff on the fan tail. There was no wind that morning. A light dusting of snow had already made itself known since colors were posted that morning. Nothing overly fancy, I just thought it was a nice picture. Quiet moments are worth noticing when you realize that you hear the diesel engines 24/7 on board. 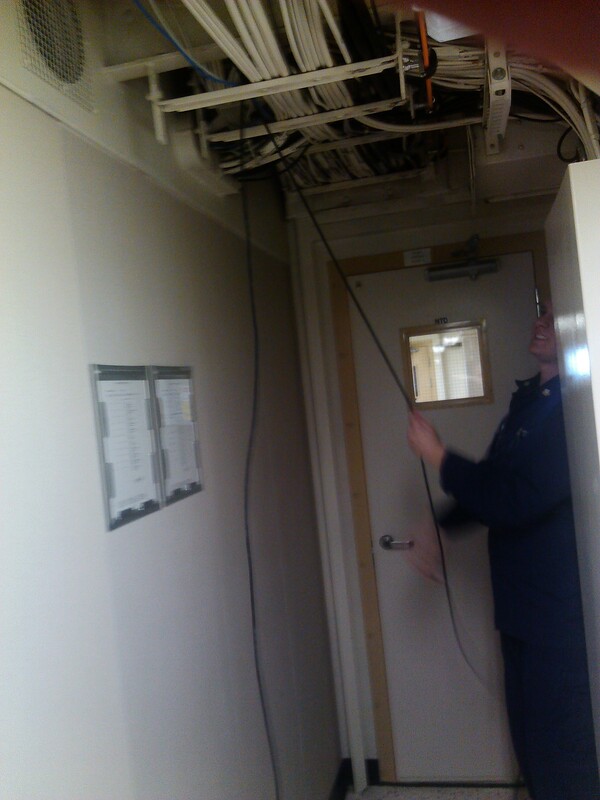 Here we have an Electronics Technician pulling some cable. I believe he was installing some new CCTV cameras, but I’m not positive. The work that each person on board does is very specific to their training and abilities. Being an ET, this shipmate is good with cameras, radios, radars, and other fancy mechanical gizmos. Work carries on regardless of the time of day. In this case, it was late afternoon and he was rushing to finish before heading off to watch. In preperation for an Admirals visit, it was all hands on deck commencing a Field Day. 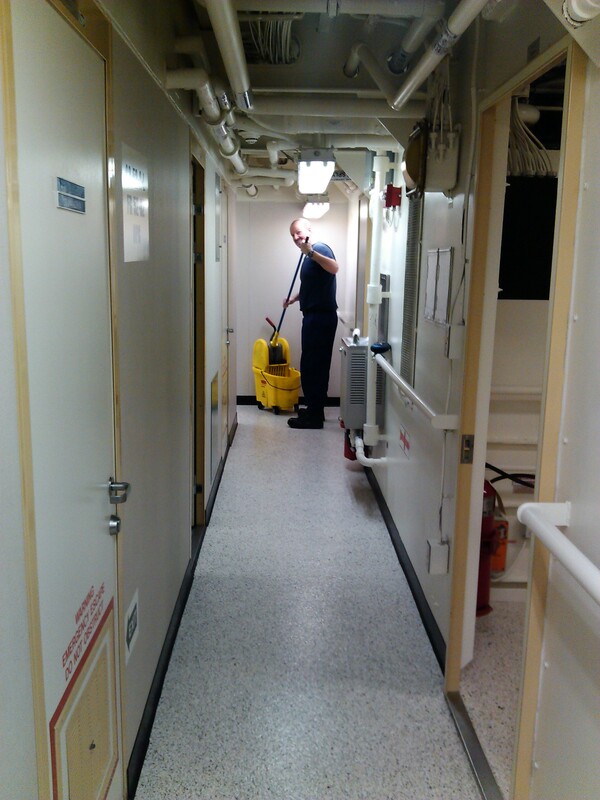 For those not in the know, a field day is where we clean every last surface on the ship. Considering all of the wires in those overheads, that’s a LOT of surfaces. PO Poppink is diligently operating a swab in this great photo. Due to the small crew size on Mackinaw, everyone from the lowest grunt up to the senior enlisted guys will be involved in shipwide cleaning. This is another photo from the field day that was going on before Admiral Parks came to visit. Two of our cooks were working on the messdeck to make sure it was ready. There was horeseplay involved for sure, but they were still working. 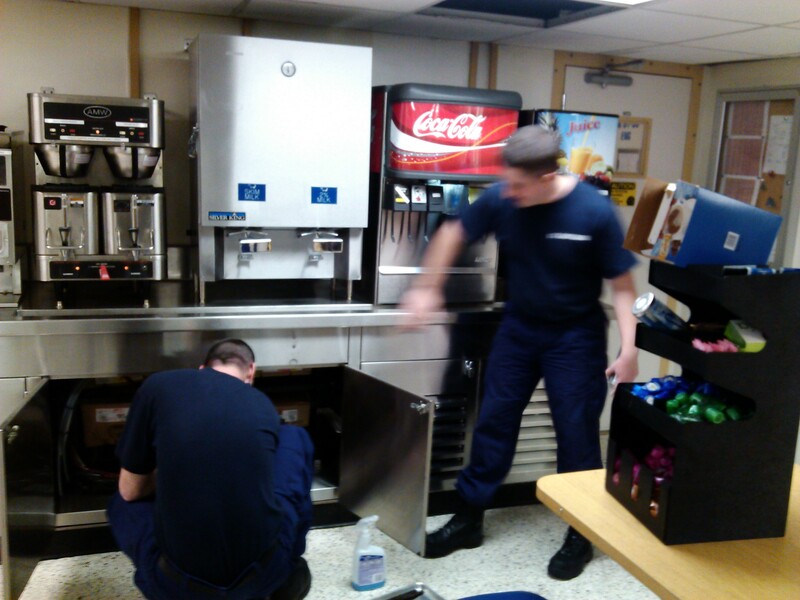 From cleaning stainless steel, to making sure the china was ready, to even going as far as to clean under the soda syrup boxes inside a cabinet, they were making sure their spaces were ready. 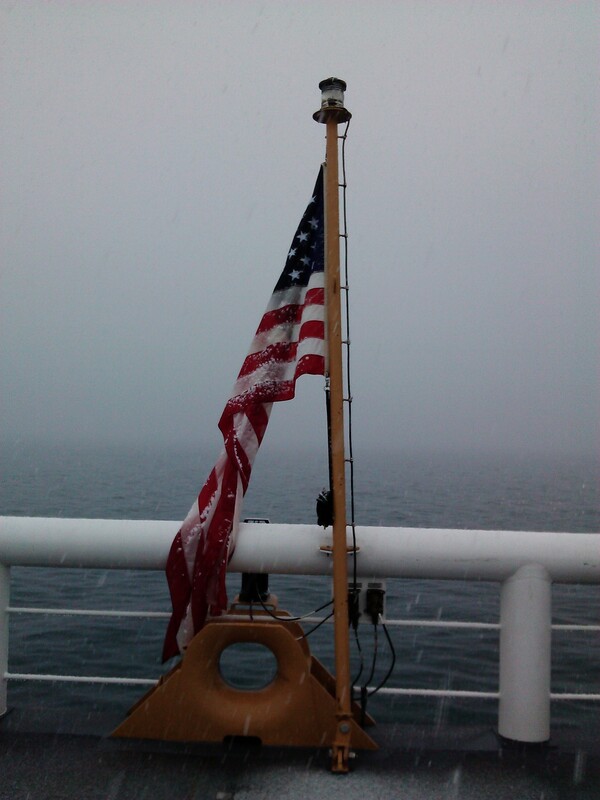 Any time we have a flag officer coming aboard, there will be an all hands evolution to get the ship ready. After a few days underway, hiding from some weather, a day or so anchored out somewhere, and plenty of steaming south, we finally arrived in Cleveland. It was actually really nice while we were there. 43 degrees in the middle of January is unheard of. I can’t complain about the good weather really. 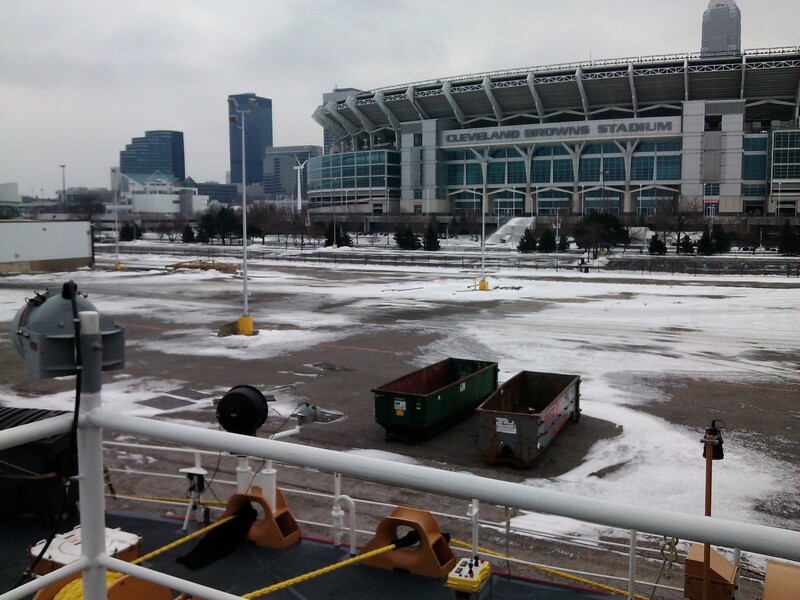 We had moored at the Port Authority in Cleveland just next to the Browns stadium. We were close enough to hit it with a rock if we really tried. 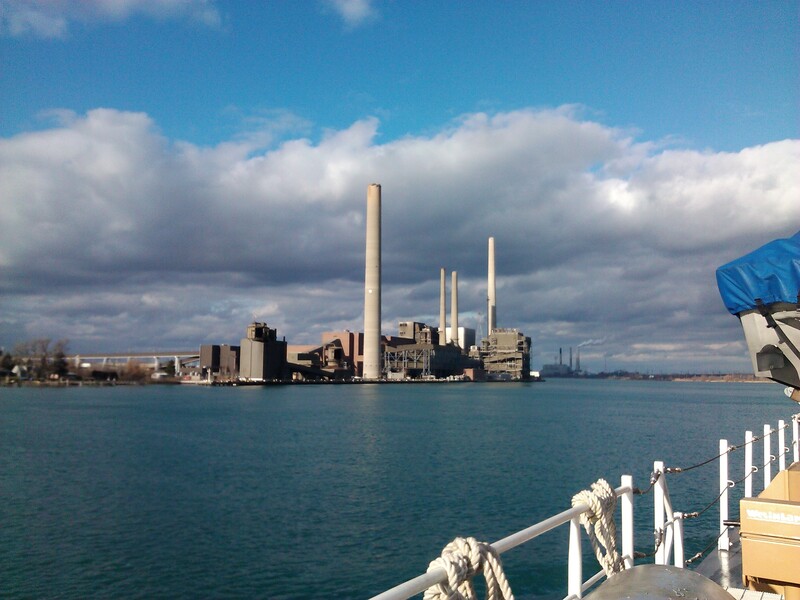 Recors (Pronounced Recourse) power plant. During the winter, this is one of our homes away from home. Half way down the St. Claire river from Port Huron, this place had a deep enough moorage that we will pull in at night and prep to be underway the next morning for additional ice breaking. Considering how mild this winter has been so far, we don’t have any ice to be breaking right now. I’m not complaining mind you, but it’s mildly frustrating when our purpose for being out here is stalled by a lack of ice. The majority of the work we’re doing is weather based so we can’t really predict what we’re going to be doing. Either way, we are still out here. We’re still doing the patrols. We’re still ensuring public safety. I love what I do, and while being on a ship is hard, it’s rewarding. As usual, I hope these simple photos give a glimpse into life underway. The distance isn’t that far. It really isn’t. However, I’m faced with an infuriating situation. I am current;y “underway” breaking ice on the Mackinaw. The job in and of itself isn’t a big deal, however where I’m at and what I’m doing right now is irritating me. I live in Cheboygan Michigan. But right now I’m sitting moored at a pier in Port Huron Michigan. My wife and kids are sitting back home and I’m sitting on the boat. See, the distance isn’t great, but I can do NOTHING about getting closer to them. I miss my family and my wife more than anything else right now. It’s heart breaking how much I miss them. It’s angering how much I want to be where I could hold and hug my wife and kids. But… I’m sitting on the boat. At a pier. With NOTHING within walking distance. Almost a prisoner of this place.